Political leadership changes are rippling over the world. A global pessimism fueled by "worst recession since the 1930s" is helping to create an anti-incumbency wave. Australia replaced its 10-year old prime minister, John Howard, with a youthful version. US elected its first "African-American" American president, creating history after a long line of "European-American" presidents. The chronically demoralized black community will take some time to absorb the shock of happiness and inspiration. US has a blank canvas to redraw its global image. 4 days after US, there were elections here in NZ. 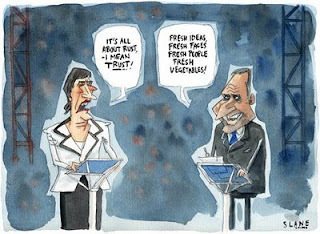 And true enough the current government with a 3-term, 9-year serving prime minister, Labour's Helen Clark lost. The new prime minister is National's John Key. National includes NZ's first Sikh member of parliament, Kanwaljit Bakshi. If has been interesting that in these elections the contestants seemed to be arguing on the same side of popular issues. With more similarities than differences it has been called "a fight for the centre". Perhaps a by-product of the demise of socialism-communism.